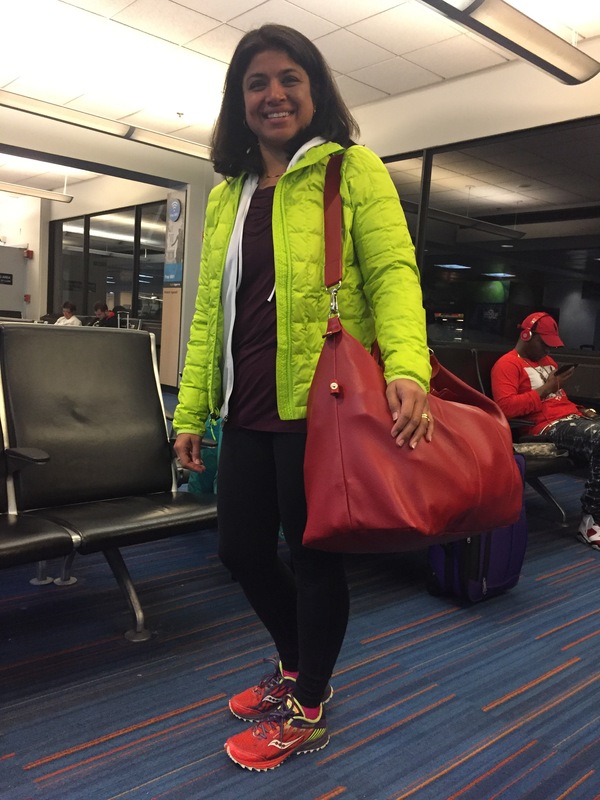 Still en route to Disney for the marathon and in case anything happens to our luggage (and since I had two trips worth of packing to do) I brought on my new weekender duffel to carry my overnight and running gear along with my noodling around clothes for 3 days and rain gear if needed. Before the reveal, I have to say that finding this bag was somewhat of an ordeal. I had struggled with my two existing “overnight” / “gym” bags for past 2-3 day trips. I always ended up with an extra bag for either running clothes or toiletries or something. What I really wanted was a generous bag that would hold a couple days of daywear, running stuff, and some nice going out stuff. 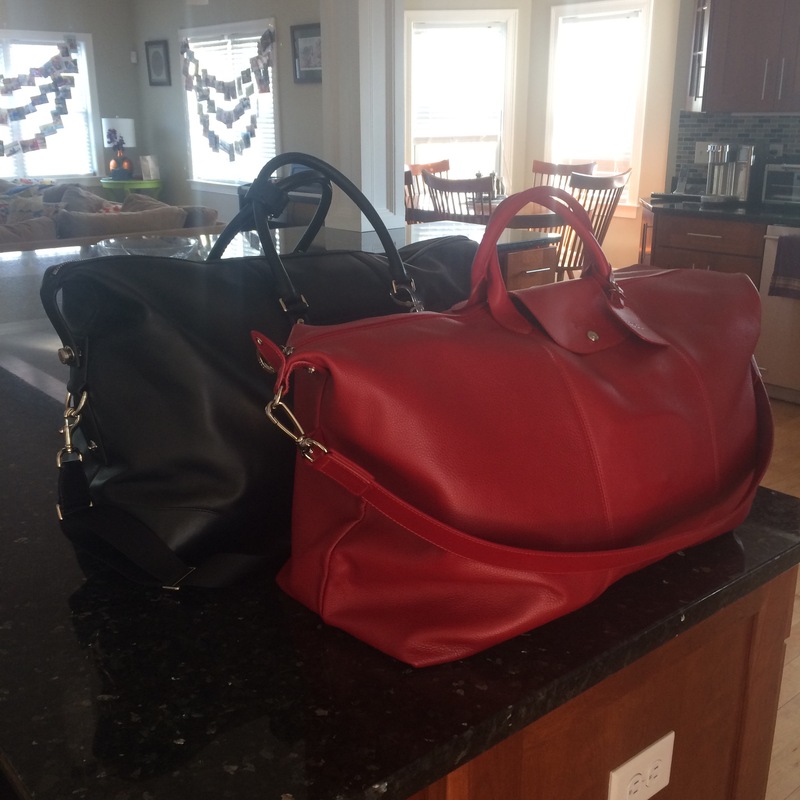 My inspiration was this amazing (now discontinued) Coach duffle I had given my husband last Christmas. It was just gorgeous to look at with soft as a baby’s bottom leather and sharp chrome hardware and it held a ton. For my past two trips without him I managed to coerce my better half into letting me use it. It was perfect for fitting everything and I was on a mission to find one of my own. But I am me so I wanted one with a pop of color. Or some other feature that would make mine stand out as different from his when we did succeed on date weekends. I ran into quite a bit of trouble finding anything “for women” that was longer than 18-21in and anything targeting any gender that was not black or brown. I have also never been super into monogram bags that are egregiously overt in displaying brand identity. But I will admit that I did thoroughly research the luxury brands of Gucci, LV, and Burberry exploring sizes, colors, and possibly subtle patterns. In the end I had zero desire to pay the price of the blue book value of my car for a bag I would use only a few times a year, and certainly not one that was canvas – I don’t care how well it was coated or what the history is. But I did want another investment piece that was quintessential me and would make me happy to use it for years to come. At some point during my search my sister visited and commented on her Longchamp bag and how much mileage she had gotten out of it as a durable day bag. Of course she was talking about the well known Le Pliage line of brightly hued nylon bags with iconic leather trim/shape. Now these bags do come in various size but I did not want nylon. 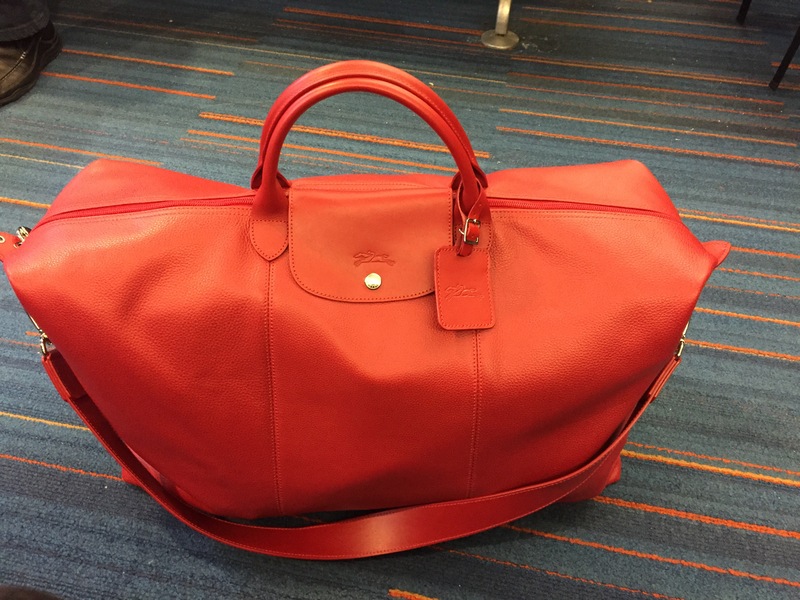 But I found myself checking out the Longchamp website to see what else they might have. And, voila. There it was. It came in a color the manufacturer calls vermillion. Red has always been one of my favorite colors. I have a lot of red in my wardrobe. It’s my signature work color with my clogs and giggles. Vermillion also evokes my cultural heritage as well. And today for this trip I debuted the bag. I packed before heading to work for the day in anticipation of a quick turnaround to the airport. My husband texted me this picture of our weekenders side by side with the message “Don’t they look lovely together” and it made me grin. They are, indeed a perfect pair. 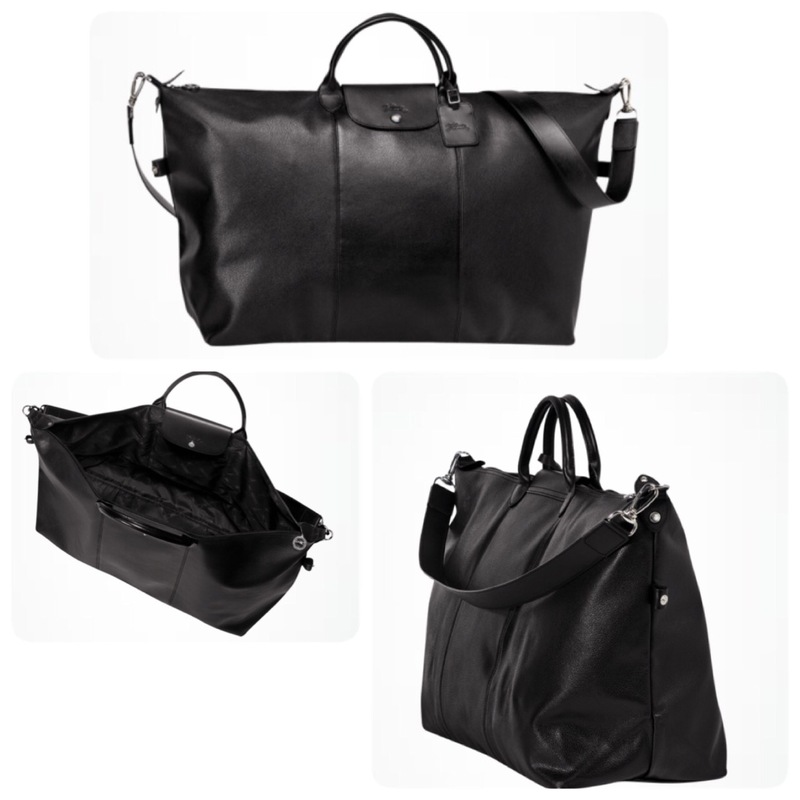 This Le Foulonne leather extra-large travel bag is simple and spacious. Two internal slat pockets in the jacquard lining, rolled handles a removal shoulder strap, snap tabs to convert from a satchel to a duffle silhouette, and the iconic Longchamp leather button tab (subtle rather than over the top attention getter). It’s super light to and folds for storage without permanently taking on the folds in the leather. Here it is filled with so much stuff and looking great at the same time. While my original vision for this bag was short local trips of 2-3 nights I am delighted to christen it on our flight to Disney. Here I am ready to board.